[Feature available for Scoop.it Pro, Scoop.it Plus]. You can measure your topic pages' traffic trends, posts performance and audience engagement with Scoop.it analytics as well as track them with Google analytics. Note: the above will give you access to analytics for your combined topic pages but you can focus on a specific topic by scrolling down and clicking on any of your topic in the "Performance by topic" section. 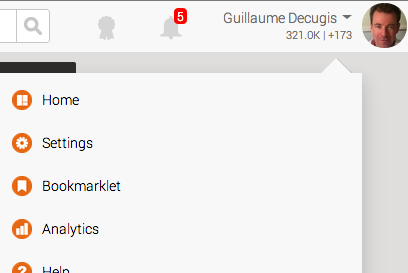 Key Metrics (overview for your entire account or per topic page) since topic or account creation (number of posts/visits/reations/followers, your Scoop.it score) and find out who’s following your topic by clicking on the number of followers. Reach: traffic (views & visitors) generated by your topic pages, location of this traffic, referral traffic sources as well as performance of the newsletters you send through Scoop.it. Engagement & Leads: find out who your most active readers are within the Scoop.it community and how they're engaged. Track the number of leads converted by your topic pages. Curation performance: measure performance for each and every one of your scoops on a granular basis (double click on a scoop from the Curation > Scoops menu to get additional details). Get insights on your publishing activity and if you're curating as a team on the activity of each of your curators. For additional information on Scoop.it analytics, you can also read this post on our blog. If you'd like to use the same code across all your topic pages, click the corresponding option. 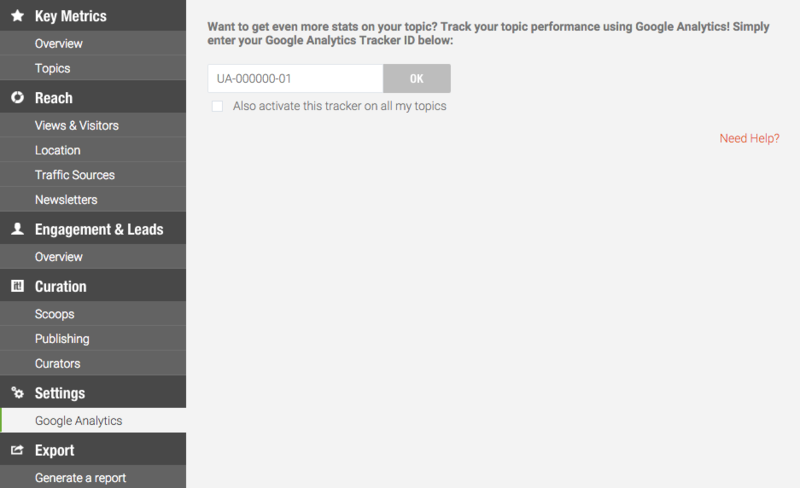 Once you click OK, Google Analytics will start tracking your Scoop.it topic pages' traffic as any of your websites.